Watchdog's own "solar tracker" weighs in with thoughts on the new mistakes that have been made in the handling of Sussex County's solar nightmare. This is important reading -- and pay close attention to what goes on at tonight's away-from-home Freeholder Board meeting in Vernon. Graham's group reminds me of when Obama first took over and told us how FOIA would be respected and transparency would be the rule. Then the opposite happened. What is Item E in Section 10, of the Consent Agenda? You can't understand what this item is about from reading the Resolution, let alone Item 10E. And Exhibit A, providing context, was purposefully left off the Agenda. Maybe this is a misdirection play, but solar should not be gamed. Where is a solar investigation? The solar program is blowing out losses well beyond the original Eskilson/Re declaration of losses of $900,000 a year. Last May, the Freeholders went into debt for $3.1 million more claiming it's because Sunlight hadn't received Federal 1603 money. Why is the County guaranteeing Federal subsidies to private enterprises? Yet this $3.1m was not listed in the Year 2015 public bailout summaries. Freeholder Graham still won't tell us if solar gen build out construction met promised levels. Freeholder Graham can't account for 3,000-4,000 SRECs/yr. The solar program has gobbled up 2% of the operating budget and we're not building anything, won't own anything and the County taxpayer was never to receive any benefit from it. And the biggest issue - how did Freeholder Graham get appointed to close-out the solar program? Where was the Board vote? What is the definition of closing out the program? What committee was formed and just what powers does Graham have to closeout? Who has been the prior county solar program manager for the past 2 years that Freeholder Graham now replaces/oversees/aides/fills-the-vacuum-for ( truly, what is this "role")? This is a most unusual way for a Freeholder Board to work. Should anything "solar" be on a consent agenda today? Shouldn't there be a discussion for all solar contractual issues with a vote at a following meeting? After all, any Addendum/Consent added to a Special Purpose Entity contractual arrangement may have wide ranging, unintended ramifications that are not necessarily seen by the public. We saw this with the very first one, Addendum #1, that permitted protected construction funds to be raided for finance and legal payments which then caused mayhem years later. Addendum #1 was passed in a similar way that avoided public awareness that insiders had lost control. Shouldn't any solar program change, no matter how minor, be publicly aired with weeks between the airing and a vote? More than anything, this is about transparency and proper public reviews for a program that continues to bleed red ink in a climate of secrecy. Read the Resolution, Section 1 reads like a blank check - although Exhibit A is missing to provide context. 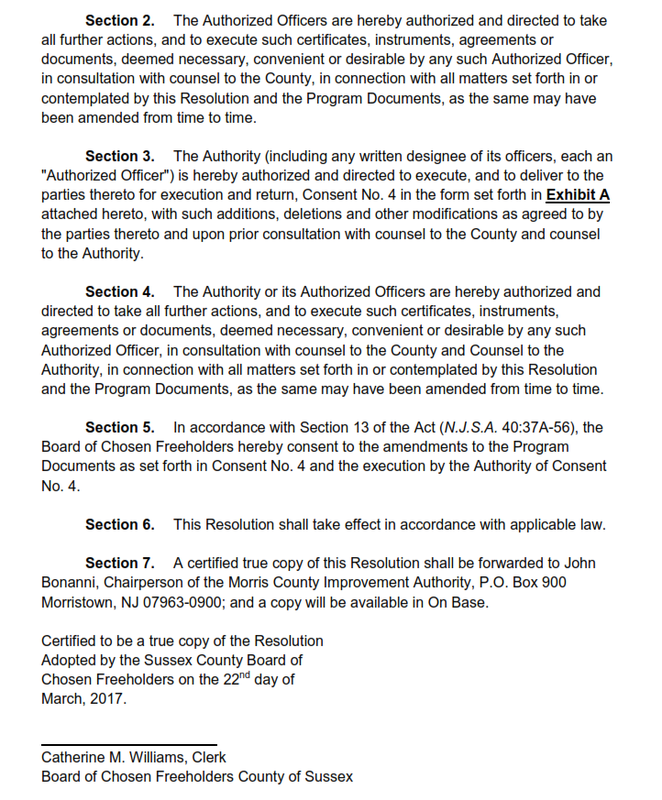 How does Section 1, combined with Freeholder Graham's appointment to close out solar, read to you?